To start the review we want to point out this review is about the 2015 model of the Grays Nano 9 hockey stick. In this years model the Nano 9 features only the Jumbow shaft profile, which is a low, long curve. Grays Nano sticks are fantastic, the 9 is up at the top of the range and being a player in England didn’t take long to hunt one down on the field. Grays are the oldest, most respected brand in the UK hockey market and in fact the world. The Nano 9 hockey stick is very very powerful, featuring Grays awesome Nano carbon weave and huge carbon content the Nano 9 is one of the stiffest, most powerful Grays hockey sticks on the market. Now not publishing the carbon content online, Grays let you know after buying a hockey stick that the Nano 9 is a 90% carbon content beast of a stick with the rest made up from aramid and resin. Immediately when picking up the Nano 9 I wanted to review how stiff it was. As I re-familiarised myself with the Jumbow shape shaft however it was impossible not to dedicate a chuck of the review to how great this shape is. Officially the Jumbow is a 200mm high, 24.75mm curve so reads like a low bow specification. It is noticeably a low bow there is no doubting that, however the Jumbow shaft on the Nano 9 is what I describe as a long bow. 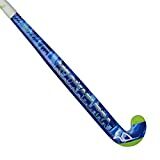 The whole hockey stick is shaped as a steady curve right from the top to the bottom, with a little extra at the 200mm up mark. This shape makes those wide drag-flicks we see from the pro’s more possible and also, for me, makes it great to dribble with once you get used to it. Almost like the Gryphon Classic Curve with a little extra in the lowest area of the stick. Like all Grays hockey sticks for I have review they are on the chunky side and the light version isn’t as light as other brands out there, if you want light light you need to review other brands like Osaka, however for the type of fitter more regular player the Nano 9 is aimed at the weight won’t be a problem. What I personally love about Grays hockey sticks is the measures to try and make it last. In the 2015 model of the Nano 9 there is this Carbon X feature, which is an additional material component added to sensible places on the hockey stick that normally get beaten up when playing a few times a week. Certainly the 2015 Nano 9 I used that inspired this review was still in pretty good shape on the heel, face and reverse edge after a season and a bit. So it makes for pretty good value for money compared to other sticks I’ve seen costing this initial price tag. Also pleasing about the Nano 9 were it’s ascetics. Personally I find Grays hockey sticks sometimes look like your granddad trying to be cool, or worse not even bothering to look cool . The Nano 9 has good looking Gold and Black checks and I really like the use of the hexagons to add to the design. Overall my review of the Grays Nano 9 is positive. You know what you are getting from a Grays hockey stick, quality, and if you don’t like the look of the GX models (and don’t want to pay the extra for a GR) with this type of spec and the awesome Jumbow shaft, I would buy the Nano 9 anyday. The Grays Nano technology is mind-boggling, we recommend checking out Grays Technology page for more information on is. Want to stick with Grays? Well make sure you check out our overview of the best Grays 2015 hockey sticks for an understanding of the whole range.